Thanks to Google translate, I now know how to spell “meow” in both Arabic and Persian, the two languages most spoken in the seven countries included in the current U.S. ban on refugees. And, while I know that words matter, (and I like to use words, sometimes too many words, ask my husband,) I’m just going to let my picture do the talking for me this time. Maybe you’re familiar with the Cha Cha Slide, that ubiquitous dance number played at exactly every wedding I’ve been to since 2000. I tend to appreciate a line dance with directions, not because I’m not an able dancer without the prescribed steps, but because, suddenly, SO MANY other people are out on the dance floor. It’s like being in a music video with your auntie, or a flash mob with the bride’s little cousin. So, thanks, friends and relatives who have this song played at their wedding receptions, because, I’m certain I wouldn’t experience the Cha Cha Slide for any other reason. Party on, cats! I was an art teacher for 20 years, so I always considered summer as the time when I could “catch up” on my art making. I couldn’t wait for my schedule to be free so I could start drawing again. Now that I’m working full time as an artist, I draw with more frequency, but I’m still habituated to the arty pull of summer. I like to record my travels as I am inspired by my surroundings. Sometimes these drawings are quick sketches, with impressions that are grabbed quickly to preserve a memory, color or thought. The Colosseum, the coastline of Ancona, and an empty gelato cup from a trip to Italy in 2011 demonstrate on-the-fly sketches I might collect. Other times, I rework or create new drawings or paintings back in the studio after collecting sketches and photos. These entries are more complete impressions of my surroundings where I incorporate objects, scenes, and details to capture what has seeped in during my visit. Like with the quick sketches, colors, objects, and landmarks dominate the work resulting in a portrait of the place I visited. Top: My homage to Georgia O’Keefe after visiting her home and studio in Taos, New Mexico. Bottom: St. Francis and Ganesh were both images I encountered in the mountains of Santa Fe. I was there in 2013 while a large wildfire raged on the mountain. I rarely leave the house without a means to record the world around me. I wrote a post about what to include in your portable studio, which you can see here. I find that having a sketchbook is a great alternative to staring at your screen in the airport or on long car rides. The drawings don’t have to be perfect, just a sincere effort at recording your impressions. You don’t have to travel far to find something to put in your sketchbook, either. The perfect spot to draw. This small beach is just down the street from my house. After all, as an artist, it is your duty to find the beauty in the seemingly mundane things around you, to find the extraordinary in the ordinary. I’ve drawn things ranging from other travelers to my kitchen serving bowls. I even spent one summer drawing the salt shakers in restaurants in which I was dining. You’d be surprised at the variety! I hope you are inspired in your own way to record a memory this summer. Happy art, everybody! I may have mentioned it before, but I love Illustration Friday, a site where illustrators respond to a weekly prompt based on a theme. It’s a great place to see a lot of creative responses to the motif, and to post your own theme-related work. This week’s prompt is SHELTER, which fits perfectly with some of my other recent posts. Like this Friday Art Cat on Katzenworld, this previous post about Los Gatos de Panama, and this one about a little kitty who lives in a culvert. Here’s a watercolor sketch that was inspired by a rainstorm and my cat, Miss Bean, who is wary of any water that falls from the sky. For me, it’s not only a portrait of my own cat who was a stray, but also a symbol for all the cats, and other homeless animals who need protection, food, medicine and shelter. 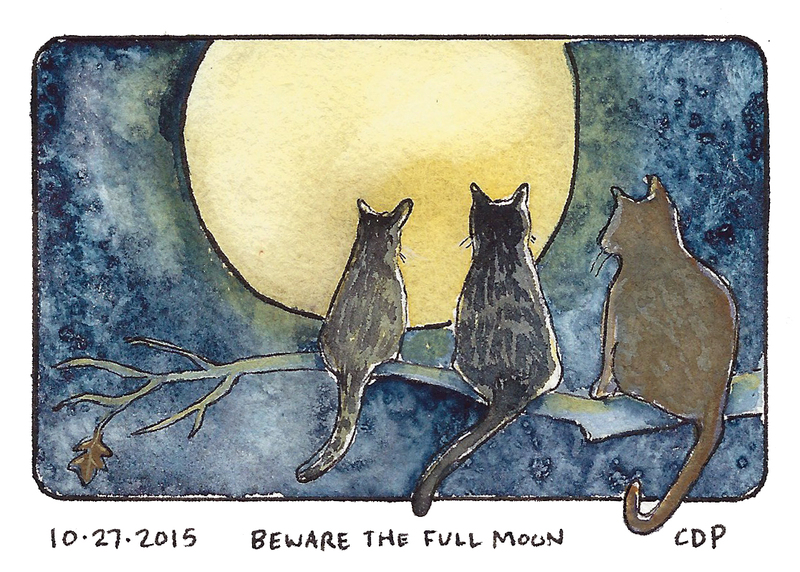 The truth is that the scariest thing under my bed is the hideous monster of self-doubt and indecision. It lurks in the darkness and dust until the middle of the night. And as I toss and turn, the beasty infiltrates the space around me, waking me with torment. 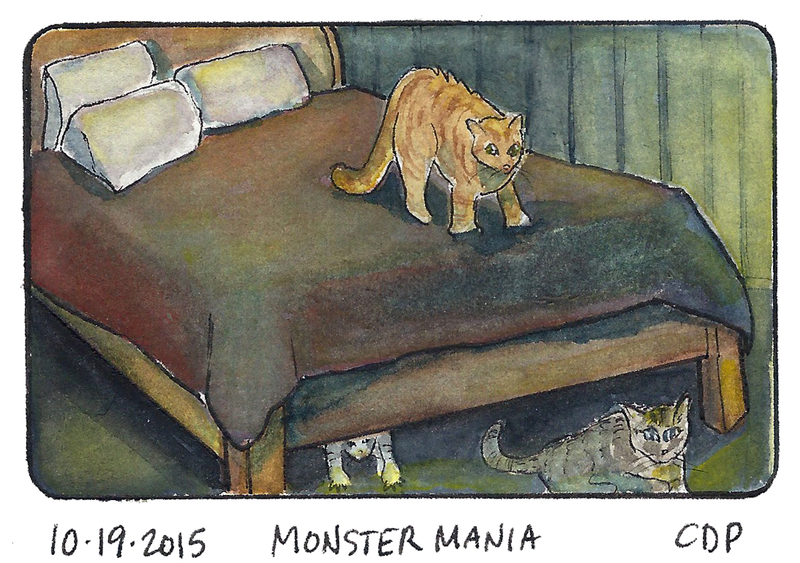 So, for today’s prompt, Monster Mania, I decided to show you some cute kitties. Hopefully, they will keep the monster under my bed away.